This weekend’s 2015 Southern California Go Championship will boast support from the largest Chinese language newspaper in the US as well as a cultural non-profit, it was announced at a press conference Tuesday. “The promotion of go is in line with goals of the World Journal,” said World Journal President James J. L. Guo. “We want to support Chinese culture, and also promote a game that stimulates the potential of children and sustains the character of adults. As Chinese media in North America, we are happy to see the growth of the go community here.” The tournament is being held in a spacious room in the World Journal’s Monterey Park offices, according to tournament organizer Kevin Chao of the host chapter, Orange County Go Club. The tri-lingual press conference held by Guo, Chao, AGA President Andy Okun and Los Angeles resident pro Kim Myungwan 9p was reported in, among other media outlets, the World Journal itself and a local Korean TV news show. “Shirley Lin 1p and strong player/teacher Evan Cho were also in attendance,” Okun told the EJ. “The history of newspaper support for go tournaments is a long and wonderful one, so we are delighted and heartened by the World Journal’s participation.” The two-day, five-round tournament is also receiving significant support from the American Asia Culture Exchange Association and its president, Jay Zheng, a long-time go player and businessman and recently an AGA volunteer. The prize pool is $3,000 with a prize of $700 for first place in the open section, and NAMT qualifying points for top finishers. Click here for more information. photos courtesy the World Journal. One of the biggest go tournaments on the East Coast is taking place this weekend. The New Jersey Open will be held in Princeton, NJ Saturday February 28 and Sunday March 1st. Registration run from 9-10a at the Frist Campus Center, Princeton University, located at the corner of Washington Road and Ivy Lane. You must be there by 10a to be paired in the first round. $38 for full tournament; $28 youth rate under age 23; $25 Sat. only / $20 Sun. only ($20/$15 under-23). Free to Princeton University students with ID. Cell phones don’t work at the site, but if you’re lost or late, call 609-851-6351 during the last half hour of registration. Info: rickmott@princetongoclub.org. Yilun Yang came to the Seattle Go Center for his yearly workshop last weekend, Feb. 21 and 22. There were 13 participants, ranging from 12 kyu to 2 dan; a mixture of new students and old friends. Mr. Yang has been teaching these workshops in Seattle since 2001, and he has fine-tuned his mixture of lectures on theory, reviews of games played by students, and go problems. He recommends that kyu players do go problems to improve, rather than studying professional games. This year, students worked on his go problems throughout the workshop, but still there were very few perfect scores at the end of Sunday. “Researchers at Massachusetts Institute of Technology’s (MIT) Media Lab are trying to turn chess into a spectator sport like American football or poker,” reports the BBC. “The group wants to make the game more accessible to the uninitiated, by presenting complex information on matches in a simple, visually appealing way and give an expert insight into the state of a game.” “Can’t we do this as well?” wonders EJ reader David Matson, who sent this along. Go is mentioned while developing a friendship with the character named Yu Jin in the game “Dynasty Warriors 8: Xtreme Legends, Complete Edition,” reports Tyler Keithley. Your Move/Readers Write: Life-Lessons of Go; Did Go Save Edward Lasker’s Life? Ida loses sole lead in Honinbo League: Ida Atsushi 8P (right) seemed to be heading inexorably for a rematch with Iyama Yuta Honinbo, but he finally stumbled in the fifth round of the 70th Honinbo League. In a game played on February 19, Kono Rin 9P beat him by resignation. Ida’s loss means that Yamashita Keigo 9P pulls even with him on 4-1; we might see another play-off between these two. Cho U 9P and Kono, both on 3-2, are also in contention. In another game played on the same day, Yo Seiki 7P picked up his second win when he beat Ryu Shikun 9P; playing white, he forced a resignation. Yo improves to 2-3 and has an outside chance of keeping his league place. Ryu and Takao Shinji 9P, both on 1-4, have lost their places. The 2015 edition of the Iwamoto Awards has gone global. “Thanks to internet and social media, the world has become smaller, so we think it is time to invite people on a global scale to submit go promotion projects,” says Harry van der Krogt of the European Go Centre, which organizes the awards, supported by the European Go Federation and the Nihon Ki-in. “So many people are trying so many things these days,” says AGA president Andy Okun, who’s serving on the awards jury. “I think it is great we are giving them rewards, encouragement and incentives to keep to at it.” Now called the World Wide Iwamoto Awards, the contest – with €2,000 in prizes — is named in honor of Iwamoto Kaoru, who devoted much of his career to promoting go around the world. 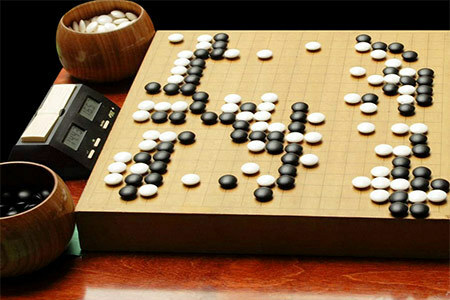 The goal is to motivate go players “to think about how go can be promoted,” organizers say, so that “through the gathering and exchange of ideas it can lead to a higher quality of popularization of go all over the world.” A top prize of €1,000 will be awarded, and two “encouragement” prizes of €500 each will also be awarded; click here to see examples of previous winners. Deadline for submitting proposals is June 1, 2015; click here for criteria/rules and to apply online.